During Central’s April board meeting, Hydraulic Project Operations Manager Cory Steinke engaged board members and everyone else at the meeting in an exercise to illustrate the complexity and difficulty of managing water supplies. Each participant was given a stack of pennies that represented the existing – and future – water supply in storage at Lake McConaughy. During the exercise, Steinke was repeatedly asked for more information pertaining to various snowpack conditions, irrigation demand, upstream storage reservoir conditions, weather forecasts, etc. But a crystal ball was not part of the game, just as water managers usually cannot see clearly very far into the future. They must rely on the best available information – both short-term and long-term – on which to base their decisions and even the best, most recent information, can be subject to rapid change. 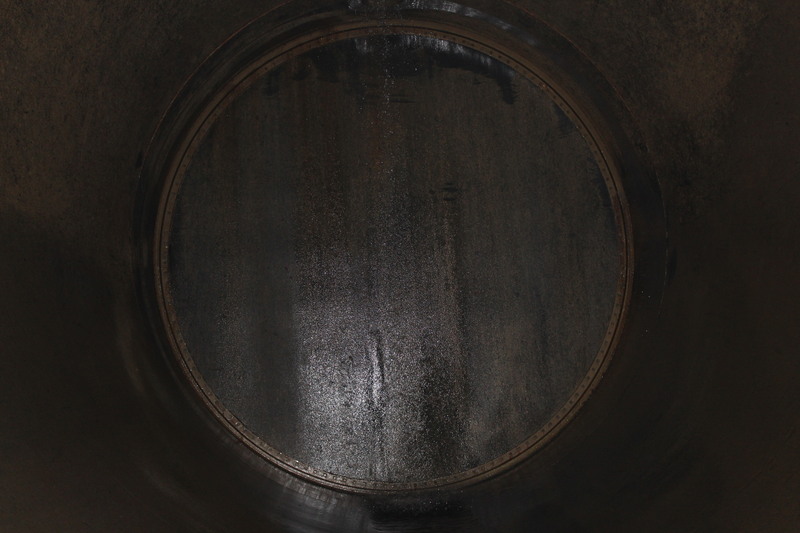 Operational projections begin with known quantities of water in storage at the beginning and end of any particular cycle. Despite having access to the latest forecasts, any unexpected changes to any of the numerous factors that influence water management operations could leave the participants “penniless,” or at the other end of the spectrum, having too many pennies in the bank. One need look no further than the recent events afflicting eastern and northeastern Nebraska and western Iowa. 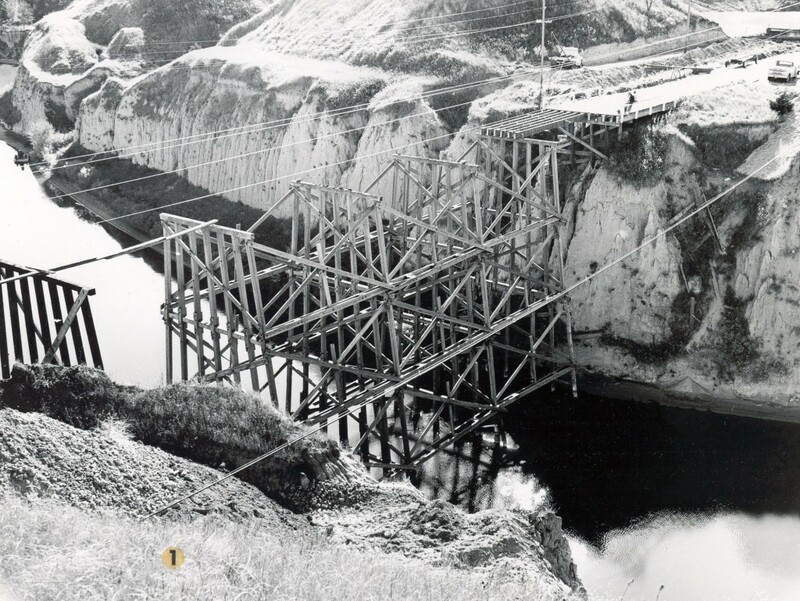 The flood damages were the result of a series of unlikely events occurring simultaneously, creating a scenario that overwhelmed manmade dikes, dams and operational plans and caused creeks and rivers to swell out of their banks. A coincidence of “unlikely events” is not the same as “impossible events;” even planning that prepared for “unlikely events” and “maximum probable floods” was overcome by the capriciousness of weather and Nature’s unrelenting power. While flooding along the Platte River did not occur in central and western Nebraska, spring is the time of year when water managers keep particularly close watch on conditions in the upper Platte River basin. The U.S. Bureau of Reclamation, which manages a series of reservoirs on the North Platte River in Wyoming and monitors snowpack/snowmelt conditions in the North Platte and South Platte drainage basins, recently released its projections for runoff. The April forecasts indicate the spring snowmelt runoff will be above average. Total April through July runoff in the North Platte River Basin above Glendo Dam in Wyoming is expected to be 1,005,000 acre-feet (a-f) which is 111% of the 30-year average. As of March 31, storage content in the North Platte Reservoirs was 1.8 million a-f, which is 110% of the 30-year average. The total conservation storage capacity of the North Platte Reservoir System is approximately 2.8 million a-f. At this time, the Bureau is not anticipating a spill of water from Pathfinder Reservoir. In the South Platte River basin, snowpack conditions are currently at, or slightly above, normal for early April. 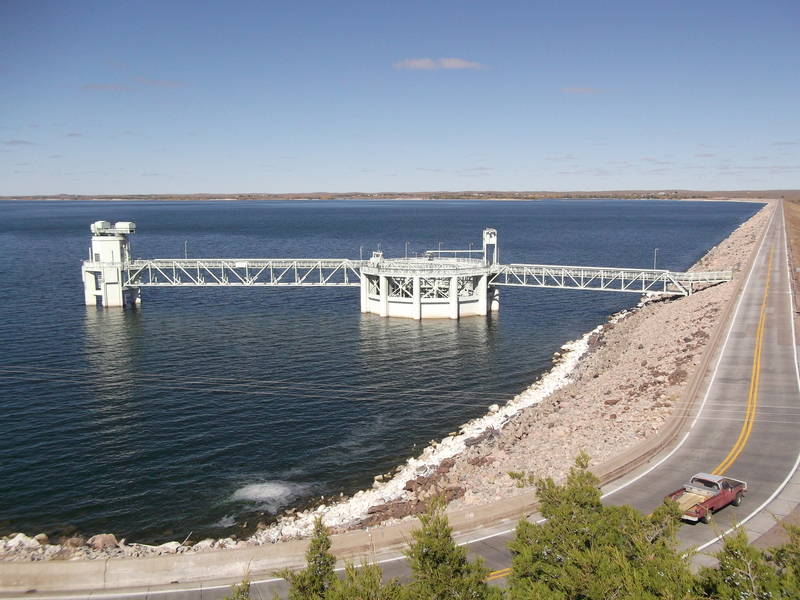 Prior to the projections, Central had noticed the increasing snowpack and began making adjustments to water operations to leave space in Lake McConaughy for any extra water released from the upstream reservoirs. However, the South Platte River remains, as always, a wildcard. 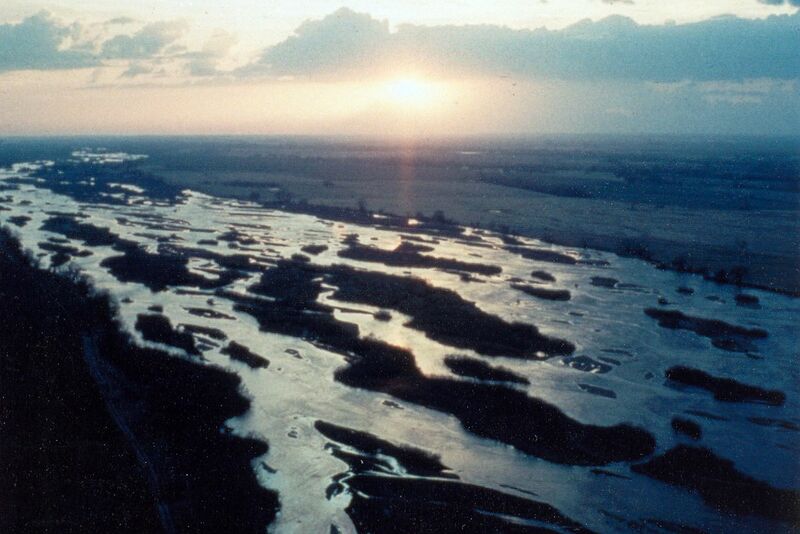 With only minimal amount of off-stream storage capability in Colorado, the South Platte remains susceptible to rapid snowmelt runoff and heavy spring rains that could cause high-water events in western and central Nebraska after it joins with the North Platte River east of the City of North Platte. Central will continue to monitor developments in the North and South Platte River basins this spring and is tailoring operations to developing conditions, including precipitation forecasts for April and May that call for increased chances for above normal precipitation throughout most of the Platte River Basin. 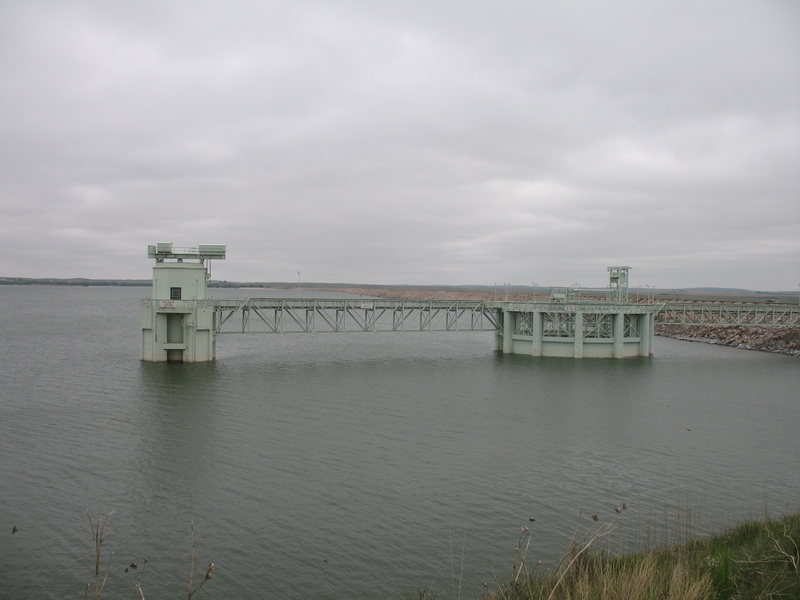 Lake McConaughy has no designated flood pool (an amount of space in a reservoir designed for flood control used to regulate floodwaters), other than gradually rising restrictions on maximum elevation during the spring, but the reservoir has been operated during high-flow periods when necessary to mitigate downstream flooding that is often the result of high South Platte River flows. But as demonstrated by recent events, Mother Nature sometimes has plans of her own that overwhelm human efforts to manage our rivers and streams. You can’t say it wasn’t expected. 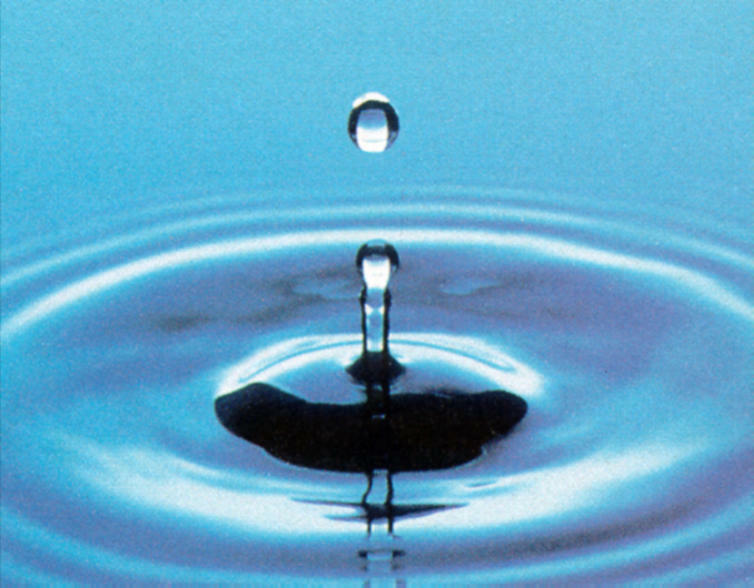 A bill in the Nebraska Legislature this session sought to take money from the Water Sustainability Fund (WSF) for a purpose that was completely unrelated to the original intent and objectives of the WSF. Thankfully, the bill did not pass, largely due to the efforts of a number of senators who opposed the measure. However, it reminds those who are responsible for managing the state’s water resources to remain vigilant about such future attempts. Former State Senator Tom Carlson of Holdrege (Dist. 38) introduced a bill during the 2013 session that created the Water Funding Task Force. The task force consisted of 34 members concerned with ensuring sustainable use of Nebraska’s water resources. Original task force members represented virtually all of Nebraska’s water resources interests, from agriculture, utilities and municipalities to wildlife and recreation. The task force’s objectives were ambitious in scope, but can be condensed into a few primary goals: make recommendations for developing water-funding legislation that would contribute to achieving sustainable use of water in Nebraska; identify potential sources of funding for programs, projects and activities; and develop a set of criteria by which potential projects would be evaluated and ranked according to how well they met the criteria. The task force met more than 30 times between July and December 2013 at various sites across the state. The product of these meetings was the establishment of a Water Sustainability Fund intended to assist projects (with a 40-percent match from the sponsor) that increased the available water supply, reduced water use, increased stream flows, improved water quality, provided flood control enhancements, ensured adequate water for agricultural, municipal and industrial uses, addressed wildlife needs, and improved recreational benefits. The efforts culminated in the passage of LB1098 during the 2014 legislative session, which created the WSF and assigned its oversight to an expanded Natural Resources Commission. The scoring criteria for the WSF developed by the task force was later refined by the Natural Resources Commission with focus on significant and expensive water issues that match the fund’s objectives. The recent attempt in the Legislature was to reallocate funds from the WSF for use in establishing water supplies for community gardens. Certainly a commendable purpose, but it failed to fit with any of the objectives identified for water sustainability funding. Perhaps more importantly, passage of such a bill would have set a dangerous precedent, one that would have encouraged additional efforts to siphon funding from the WSF. The WSF has seen in the past two years a reduction in its funding, as money is reallocated to help address the state’s budget shortfall. That’s understandable; almost all state cash funds have been reduced. Additional hands shaking the piggy bank in the future would diminish the state’s ability to achieve the WSF’s objectives. Memories surface of how other state program funds have been tapped for purposes other than originally intended, based on the argument that “times have changed and so can funding appropriations.” That may be true in some cases, but not for the WSF; its task remains the same. Now entering its fourth grant cycle, the need to sustain and protect Nebraska’s water resources is as great as ever and it is the state as a whole that will benefit. The next drought is always lurking around the corner. When it inevitably arrives, the water sustainability improvements made possible by the WSF will prove their worth. Nebraskans who value the original intent of the Water Sustainability Fund to fund programs and projects that help ensure the availability of water supplies for future generations should remain on guard and be thankful to those who worked so hard to establish a dedicated source of funding to enhance and protect Nebraska’s water resources. The focus of the recent Water & Natural Resources Tour was on educating and informing participants about the many uses and benefits of water within the Platte River Basin between Ogallala and Holdrege, but there was plenty of fun, food and, yes, even exercise during the three-day tour. What follows is a short(?) recap of the tour, along with some observations from the tour. 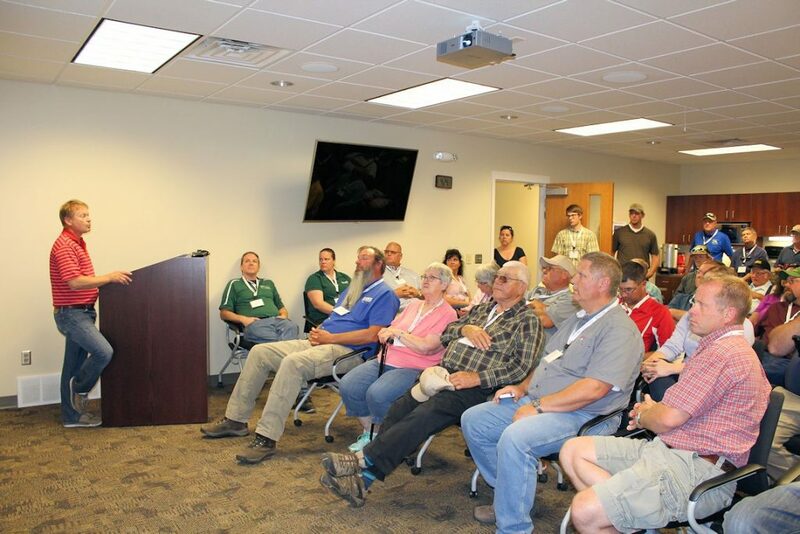 The tour participants – numbering more than 50 – assembled at Central’s administrative headquarters on the morning of June 27 and headed out via motor coach for the first stop at a site just south of the Platte River near between Elm Creek and Overton. The site is part of what is called the Cottonwood Ranch complex, which is owned by the Nebraska Public Power District and managed for wildlife habitat purposes by the Platte River Recovery Implementation Program (Program). Jerry Kenny (with microphone) of the Platte River Recovery Implementation Program describes plans for a groundwater recharge/river flow enhancement project during the 2017 tour. 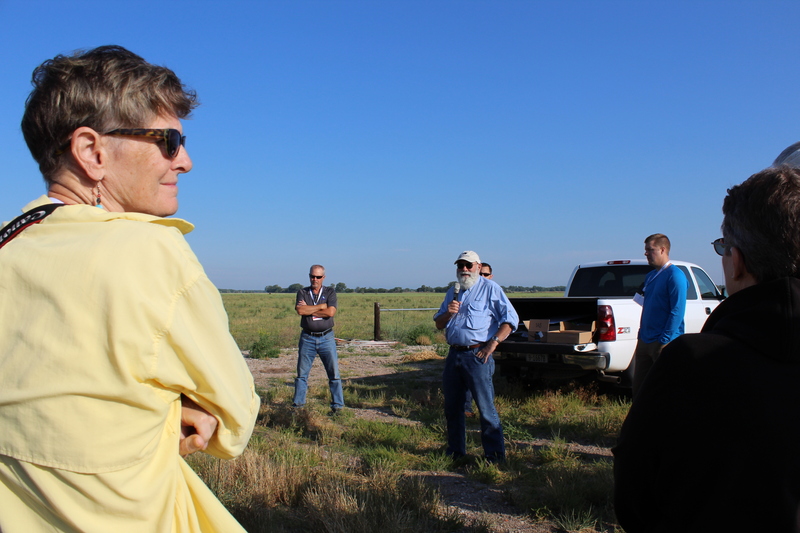 Part of the 3,000-acre ranch is comprised of grasslands and wet meadows and it is here that the Program is investigating prospects for a groundwater recharge project that will benefit base flows in the Platte River. The idea is to construct earthen berms around about 300 acres in the area, fill them with anywhere from six to 14 inches of water and allow the water to seep into the ground, which will eventually return to the river. The shallow water would also presumably attract migrating whooping cranes as a place to forage and roost. From there the tour headed to the Tom Schwarz farm to check out one of the few organic farming operations in the area. It is here that Tom, his family and a few hired hands raise organic crops and vegetables in adjacent fields and small greenhouses. The greenhouses recently sustained heavy damage from a spring storm, but inside one of the relatively undamaged structures, Tom showed off rows of peppers, tomatoes and other vegetables that are being raised without pesticides, herbicides or non-organic fertilizer. Tom also has plans to begin a small organically raised cattle herd. On the bus on the way to the next stop, John Thorburn, manager of the Tri-Basin Natural Resources District, explained the proposed Platte to Republican Diversion Project. The PRD Project, as it has become known, would deliver water from the E-65 Canal to the mouth of Turkey Creek through a pipeline bored beneath Highway 23 and the railroad tracks during times when there are excess flows in the Platte River. Any water appropriations granted by the Nebraska Department of Natural Resources would be junior to all current or future appropriations in the Platte River watershed. The project is intended to help reach objectives related to the NRDs’ Integrated Water Resources Management Plans and to assist in compliance with the Republican River Compact between Nebraska and Kansas. After about 45 minutes at the Schwarz farm, the tour headed for Elwood Reservoir and the Carl T. Curtis Pump Station, which were added to Central’s system in 1977 to improve delivery surface throughout the E-65 Canal’s service area. The reservoir is also used for groundwater recharge purposes during the non-irrigation season and has become known as an excellent walleye fishery. Water is pumped into the reservoir at the pump station and then allowed to run back out by gravity when needed for irrigation deliveries. The bus then traveled across the Johnson Lake dam; on the way the riders observed the synthetic membrane lining (a water conservation/canal efficiency measure) in the upper end of the E-65 Canal, the headgate of the canal and the inlet structure on the lake’s west side. After a busy morning, lunch was served at the Monsanto Water Utilization Center near Gothenburg while Duane Woodward from the Central Platte Natural Resources District talked to the group about groundwater recharge efforts within the district. After lunch the group headed out to the fields on pickup truck-pulled trolleys to examine studies of yields, insect and weed control, plant health and fertility, microbials, canopy height, drought stress and other topics. The tour participants also observed how the center’s “rain-out shelter” is used to ensure precipitation doesn’t interfere with studies involving drought resistance of crops. After a quick pause for refreshments, the group headed into Gothenburg for a tour of the Frito Lay Corn Handling Facility, where they learned that any of the snack chips consumed west of the Mississippi River originated as corn passing through this facility. Plant managers showed and explained to the group the control room, the load-out bays and the storage facilities at the plant. The bus then headed down the street to Central’s Gothenburg Control Center from which operational monitoring and control of most of the District’s canal structures, pump stations and hydroplants is performed. Gothenburg Division Manager Devin Brundage also explained how the water passing through Central’s system originates as snow and rain in the Rocky Mountains of Colorado and Wyoming before passing through a series of U.S. Bureau of Reclamation reservoirs and several upstream irrigation projects before entering Lake McConaughy. Central’s Gothenburg Division Manager Devin Brundage explains how the District’s control center operates the hydroelectric/irrigation project. 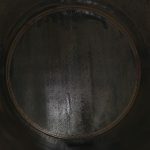 After checking into their North Platte motel, the group was treated to dinner and wine at the Feather River Winery and Vineyard, after which the vineyard’s owner explained how the facility came to be and the process of growing hybrid grapes for wine production in Nebraska’s often harsh climate extremes. After a good night’s rest (well-deserved given the pace of the first day! ), the tour participants boarded the bus for a stop along NPPD’s Sutherland Canal at which a still-under-construction pipeline will eventually deliver water from the Nebraska Cooperative Republican Platte Enhancement Project (NCORPE) well field. 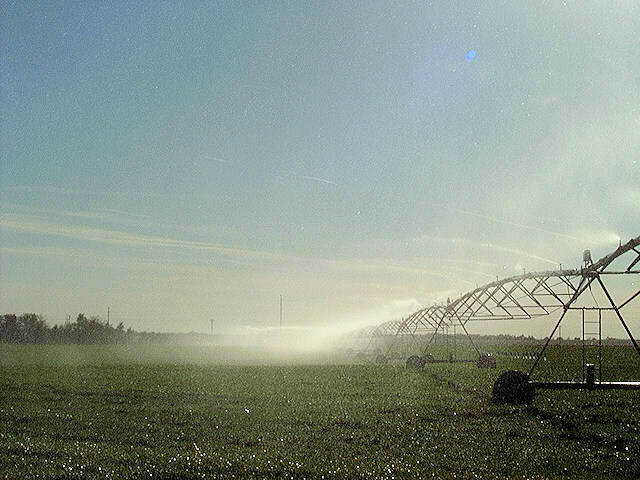 A 19,500-acre farm was purchased in 2012 by a consortium of four NRDs (Upper Republican, Middle Republican, Lower Republican and Twin Platte), the cropland was converted to grassland and the irrigation wells – instead of feeding pivots – were hooked to a pipeline to deliver water to the Republican River Basin to help Nebraska’s compliance with the Kansas-Nebraska Republican River Compact. The pipeline currently under construction will move water north to the canal and then back to the South Platte River as part of the Twin Platte NRD’s efforts to offset depletions to the Platte River caused by groundwater pumping. TPNRD Manager Kent Miller and NCORPE manager Kyle Shepherd (who also participated in the entire tour) were on hand to explain the project’s details. 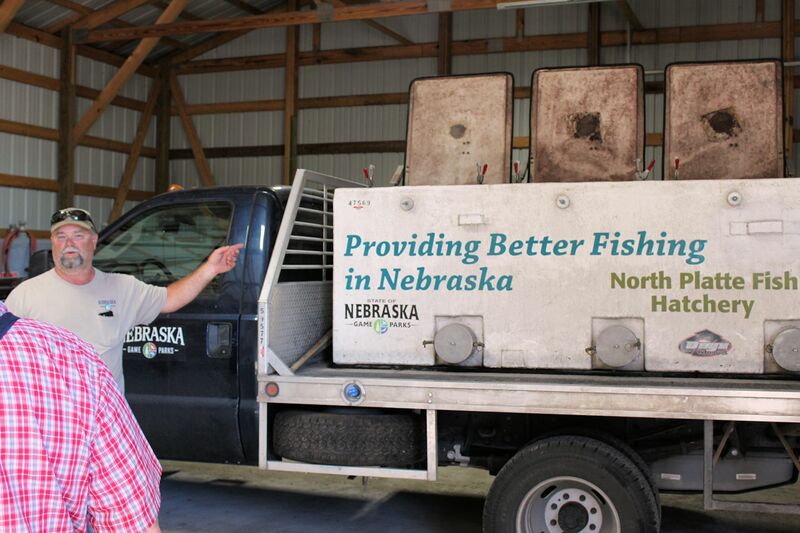 The next stop was nearby: the Nebraska Game and Parks Commission’s North Platte Fish Hatchery. Hatchery personnel, including manager Dirk Higgins, showed everyone around, including how the facility produces a variety of cool-water and warm-water fish species including walleye, white bass, blue catfish and channel catfish. When needed, the hatchery also produces yellow perch, black and white crappie, blue catfish, wiper, striped bass, bluegill, muskellunge, tiger muskie, smallmouth bass, grass carp, northern pike and largemouth bass. North Platte hatchery staff also makes annual collections of walleye and white bass eggs and milt from regional water bodies. A relatively new activity at the hatchery is an effort to raise freshwater mussels, which are becoming less abundant in Nebraska’s lakes, rivers and streams. The manager of the NGPC fish hatchery at North Platte describes the process of stocking many species of fish into Nebraska’s lakes and streams. The bus didn’t have to travel far to reach the next stop, the UNL West Central Research and Extension Center, just a mile down the road from the hatchery. At the center also known as the “State Farm,” Doug Hallum, Chuck Burr and Daran Rudnick explained current research activities on best management practices and measures to help producers get the most benefit from their water supplies. Entomologist Julie Peterson also explained how the center is investigating the use of biological controls (read: bugs and/or viruses that target insect pests on the farm) as possible tools to supplement or replace chemical pesticides. Lunch was served at the “Farm” and the group departed for its next stop at NPPD’s Gerald Gentleman Station (GGS) near Sutherland. GGS is Nebraska’s largest power plant in terms of generating capacity. Station Manager Gerry Phelps and a team of tour guides from the station explained the plant’s operation from top to bottom and how water from Lake McConaughy is used to cool the condensers (returning the steam that passes through the turbines to a liquid state). 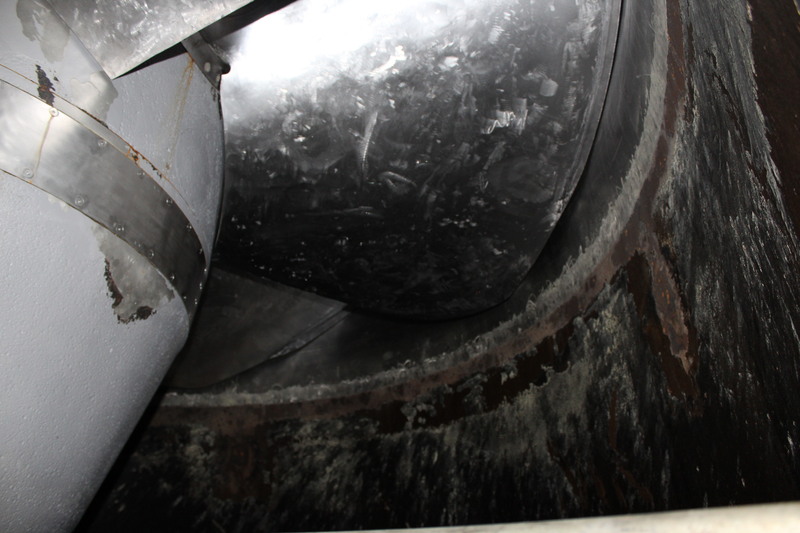 The tour also included a trip to the plant’s roof, where participants could see the coal yard and immense coal-handling equipment, the water works (including Sutherland Reservoir) and enjoy the view up and down the Platte River Valley. After the 2-1/2 hour tour concluded, the bus headed for its Ogallala motel to prepare for dinner at the Haythorn Ranch north of Kingsley Dam. The participants were treated to a wonderful meal by Jody Haythorn and her staff at the Figure 4 Traditions banquet facility and also witnessed a spectacular sunset over the Sandhills. As the group lingered on the veranda in the fading light, turkeys strutted across a nearby pasture where a few horses seemed to completely ignore them. Begrudgingly, the group had to be prodded to board the bus and leave the idyllic setting as storm clouds – which would later bring torrential rain – began to roll in. 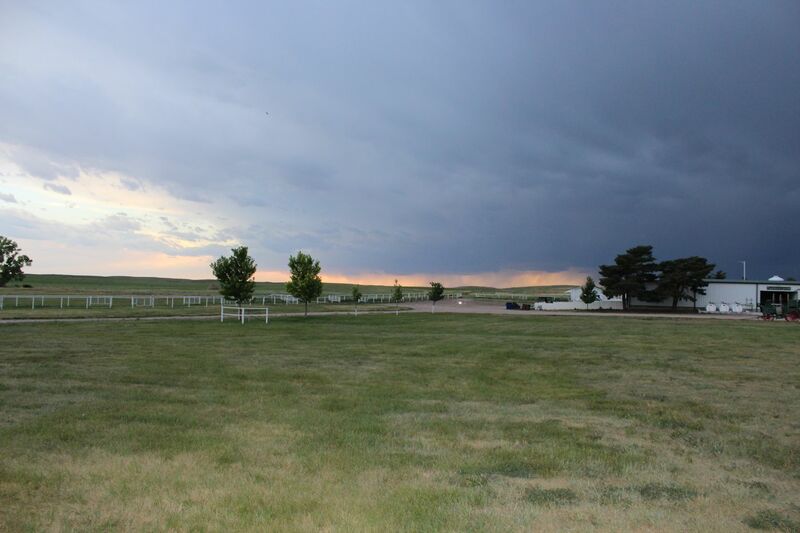 A gorgeous sunset — and an approaching thunderstorm — at the Haythorn Ranch north of Lake McConaughy where the tour group enjoyed a terrific meal and a wonderful atmosphere. The final day of the tour dawned clear and warm, with little evidence left from the previous night’s storm. The tour participants headed for the NGPC’s Lake McConaughy Visitors Center to browse through the facility’s Water Interpretive Center and listen to NGPC’s Regional Supervisor Colby Johnson explain the agency’s long-term Master Plan for recreational improvements at Lake McConaughy and Lake Ogallala. After a little more than an hour, the group boarded the bus for a tour of “Big Mac’s” outlet structures (the Outlet Tower and the “Morning Glory” spillway) and the Kingsley Hydroplant below the dam. Devin Brundage appears for the second time on the tour, this time as tour guide for the Kingsley Hydro. Here he explains the operation of the hydroplant’s bypass valve. 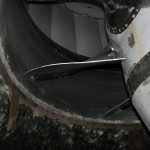 The group also enjoyed running … well, walking … several flights of stairs necessary to reach the generator floor and turbine-pit floor deep within the Kingsley Hydroplant. Gothenburg Division Manager Devin Brundage, pulling double duty as a tour guide, explained the workings of the largest hydroplant in Nebraska and answered questions from tourists experiencing their first visit inside such a facility. 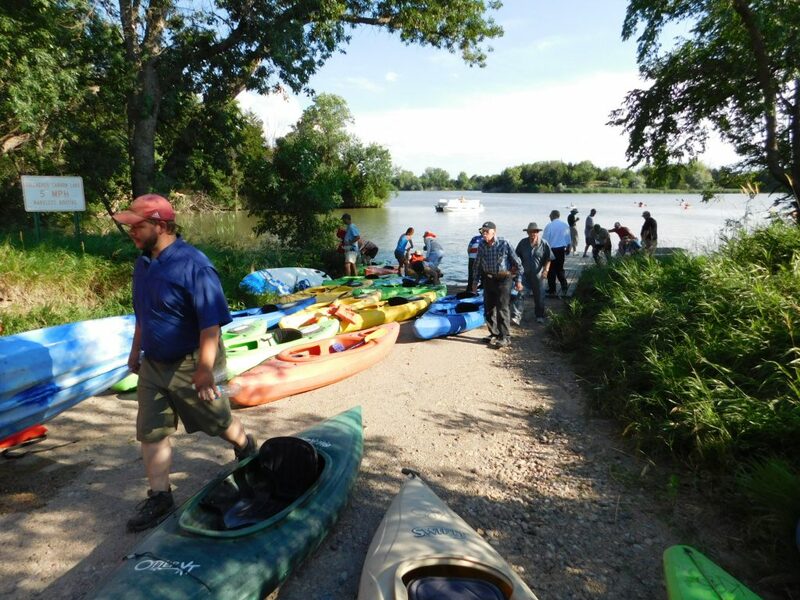 When the group members had regained their breath after climbing the stairs back into the sunlight, the tour continued down the road to Ole’s Big Game Bar & Steakhouse for a steak lunch, one more opportunity to fuel up for the final event of the tour: a kayak trip down Central’s Supply Canal from just below Midway Lake near Cozad to the Gallagher Canyon Lake boat ramp, a stretch of 5.5 miles. 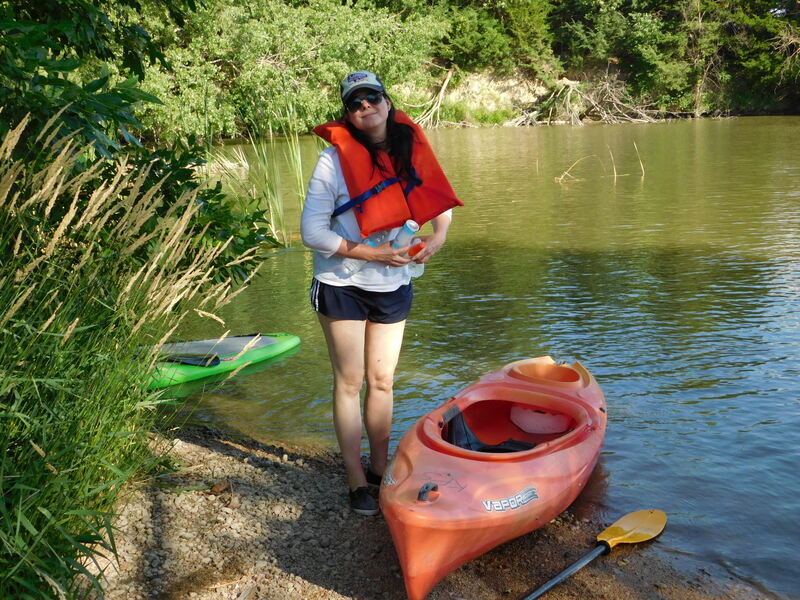 For most tour participants, it was their first opportunity to paddle a kayak, but everyone seemed to get the hang of the easily maneuverable crafts quite quickly. Those who chose not to paddle boarded a john boat and a pontoon provided to follow along. Since safety was a primary consideration, Jarrid Rickertsen – a Central employee at the Gothenburg office and a licensed emergency medical technician – piloted one of the boats and was prepared to use his EMT skills if necessary. Thankfully, there were no emergencies and the kayakers arrived at their destination in about two hours. Along the way, the group enjoyed the scenery along the canal. High banks, plenty of birds, the occasional fish jumping out of the water or swimming just beneath, and a group of teenagers using one of the high banks as a platform from which they could jump/dive/flip into the canal 20 feet below. A tired, but triumphant group of kayakers climb the boat ramp at Gallagher Canyon Lake upon reaching the end of the 5.5-mile trip down Central’s Supply Canal. Upon ending the kayak trip and re-boarding the bus, the tour concluded back in Holdrege with an impromptu pizza party in Central’s parking lot. Three or four dozen pizzas disappeared in short order as the participants gradually departed for home, many of whom expressed their enjoyment of the tour and asked about the destination for next summer’s tour. The organizing committee, composed of Steve Ress and Tricia Leidle from the Nebraska Water Center; Ben Beckman, research and extension communication specialist from UNL; and Public Relations Assistant Holly Rahmann and myself from Central, will convene soon for a debriefing session on this year’s tour and review comments and suggestions from surveys filled out by participants. Then we’ll turn the page and begin planning for next year’s tour. The destination is unknown at this time, but we’ll try to choose a tour that will be interesting and enlightening, and most importantly, fun for its participants, continuing a tradition 40 years in the making. 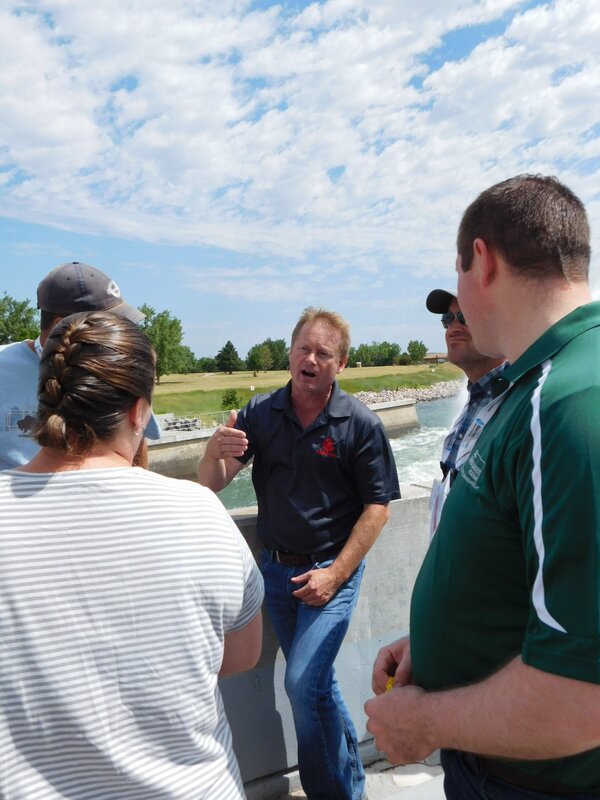 The date is still months away, but not too early to begin thinking about the annual Water and Natural Resources Tour organized by the Nebraska Water Center and The Central Nebraska Public Power and Irrigation District. This year’s tour will take place on June 27-29. The destination will be Nebraska’s west-central Platte River Basin between Elm Creek and Lake McConaughy. The Water and Natural Resources Tour began more than 40 years ago as an idea of then UNL Chancellor D.B. “Woody” Varner. What was originally an irrigation tour has evolved over the years into a broad investigation of many water and environmental topics relevant to Nebraska. Tentative stops and topics on the tour include an organic farming operation; facilities related to Central’s hydro-irrigation project, including Kingsley Dam and Lake McConaughy; the Nebraska Game and Parks Commission’s Water Interpretive Center at Lake McConaughy; projects underway by Platte Basin Natural Resources Districts; the Frito-Lay corn Handling Facility at Gothenburg and Monsanto’s Water Utilization Learning Center at Gothenburg; UNL’s West Central Research and Extension Center near North Platte for discussion of new cropping and irrigation technology research, a stop at a Platte River Recovery Implementation Program site; the Nebraska Public Power District’s Gerald Gentleman Station near Sutherland, and more. Planning is underway to end the tour with a kayak trip on a stretch of Central’s Supply Canal. Registration information for the tour will be announced soon. The latest tour information will be online at watercenter.unl.edu. Participation will be limited to the first 55 registrations. Technology is great … when it works the way it’s supposed to. Case in point: visitors to Central’s “Reservoir/River Data” web page may have noticed “anomalies” in some of the graphs. In particular, the graph depicting recent inflows to Lake McConaughy shows a sudden spike; flows coming into the reservoir – according to the graph – jumped from around 1,200 cubic feet per second (cfs) to more than 7,500 cfs. No, there wasn’t a cloudburst above Lake McConaughy and, no, there wasn’t a sudden release of large volumes of water from upstream reservoirs. The spike was caused by cold temperatures and ice in the North Platte River that interfered with gauging station equipment and the ability to accurately measure flows in the river. Similarly, the elevation graph for Lake McConaughy shows a sudden and dramatic drop in the reservoir’s water level – almost 30 feet – that, we can assure you, did not actually happen. No, the dam didn’t break and there’s not a huge volume of water surging down the river. Again, there was a problem with the data collection equipment that resulted in the generation of inaccurate graphs. Now, you might think it’s a fairly simple matter to correct the data displayed on the graphs, but it’s more complicated than that because of the nature of how the graph is populated with data. In the past, all data was manually keyed into a spreadsheet and table. The data was used to create each graph which were then manually uploaded to the server for display on the web page. It was easy to recognize when “bad” data was reported, to confirm that the data was indeed “bad,” and to input correct data. When the “Reservoir/River Data” page was automated earlier this year, the task the programmer faced was how to pull together data from multiple sources (gauges maintained by the U.S. Government Survey, the Nebraska Department of Natural Resources, and Central’s own supervisory control and data acquisition system (SCADA)) into a cohesive form and then to code the information to automatically generate the graphs that appear on the web page. However, the “bad” data is already recorded and stored in the data base that the automated system queries to populate the table and graphs on the web page. In some cases, since the data is not compiled by Central, it becomes difficult to change the source data (which is archived in the source data base) and requires manual override by Central personnel on a daily basis, a somewhat time-consuming task that was supposed to be unnecessary after automating the page. So, the upshot is that we’re working on a way to resolve the issue that typically arises when winter weather conditions interfere with gauge function. Until a solution can be found, don’t get too excited by sudden sharp spikes – up or down – in the data reported in the table or that appears on the graphs. If something unusual does occur, rest assured that we’ll let you know. So far it’s been a pretty good year … if you’re a Husker football fan or a fan of Lake McConaughy. The Huskers recently re-entered the Top 10 rankings (according to the AP and Coaches polls) for the first time in several years and inflows into Lake McConaughy also cracked the top 10, finishing the water year (Oct. 1, 2015 to Sept. 30, 2016) at number seven. The (unofficial) total of 1,665,983 acre-feet (a-f) was 344,000 more than last year (2014-15) and 961,000 a-f behind the all-time inflow record of more than 2.6 million a-f set during the 2010-11 water year. Still, this year’s mark was well above the historic median of 1,029,110 a-f and the historic average inflow of 916,900 a-f. That’s good news for the water supply in Nebraska. If you just look at the last 30 years as a measuring stick, the recently ended water year was the second highest during that period. Interestingly, since 2009-10 Lake McConaughy has experienced four of the 12 highest inflow years on record. Conversely, since 2000-01, we’ve seen the six LOWEST inflow totals ever, as well as the 8th and 9th lowest inflow years. So if you’re looking for a trend, it might be along the lines of “feast or famine” over the past 16 years. What to expect during the new water year? It appears that we’ll have to wait and see. The good news might be that the La Niña weather pattern that was expected to follow the recently ended El Nino cycle has seemingly failed to materialize. According to the National Aeronautics and Space Administration, La Nina cycles are typically characterized by below normal precipitation in the Central Rockies and the Great Plains. If it’s not a factor this year, winter and spring weather – and particularly snowfall and spring rainfall – are a coin flip, with equal chances of above or normal precipitation during the first part of 2017. Yep, we’ll just have to wait and see. Kingsley Dam was completed in 1941, so as we approach in 2016 the 75th anniversary of the dam and the beginning of project operations, we will be posting a list of historical highlights from the District’s past, sort of a “This Day in History” compilation. The entries will added according to when they occurred over the calendar year. April 11, 1941 — George Johnson, Central’s chief engineer and general manager, predicted that the Platte River would have a steady year-round flow within three years. The construction of Kingsley Dam and Lake McConaughy, which would store flows in the North Platte River for irrigation deliveries and hydroelectric generation, would eliminate the “no-flow” periods — particularly in the central Platte stretch — that were common before the dam was built. (Subsequent history would prove Johnson largely correct.) The canal system — including the Supply Canal and the irrigation canals — would eventually contribute underground return flows helped stabilize base flows in the river. Nov. 1, 1933 – The Central Nebraska Public Power and Irrigation District was officially organized after State Engineer Roy Cochran gave conditional approval to a reorganization of the District. The District’s creation had initially been approved by the Nebraska Department of Roads and Irrigation on July 24, 1933 as the Central Nebraska Public Power and Irrigation District, although several hurdles remained to be cleared. Having made progress toward gaining approval and funding for the hydro-irrigation project, the new organization – officially called THE Central Nebraska Public Power and Irrigation District – was created by the state engineer’s approval on Nov. 1. Nov. 7, 1940 – Central’s board of directors signed a farm management contract with the University of Nebraska, placing what was called the Tri-County Farm Management Farm (which was used to demonstrate best management practices to farmers still learning about irrigated farming) under the supervision of the University’s Board of Regents. 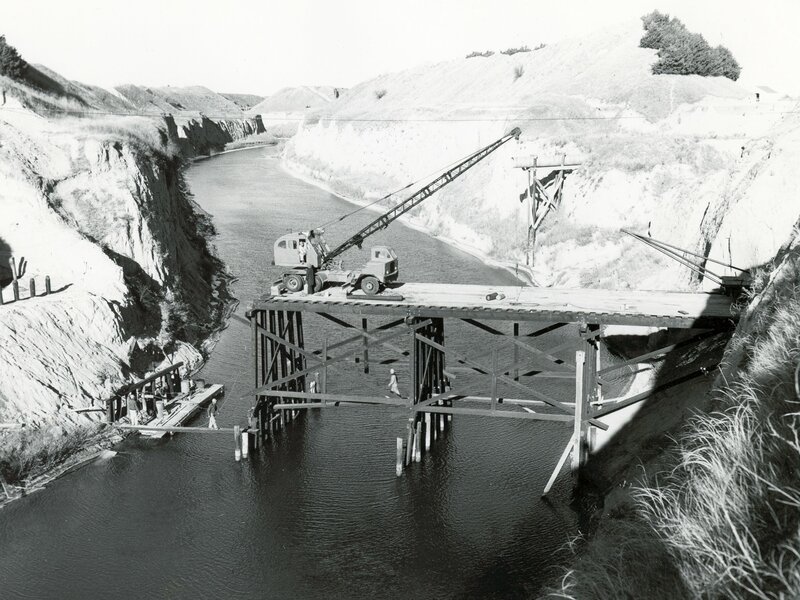 November, 1940 — The two dredges pumping fill for Kingsley Dam — one upstream and one below the dam — completed the project that built (at the time, behind Ft. Peck Dam on the Missouri River in Montana) the second largest hydraulic-fill dam in the world. 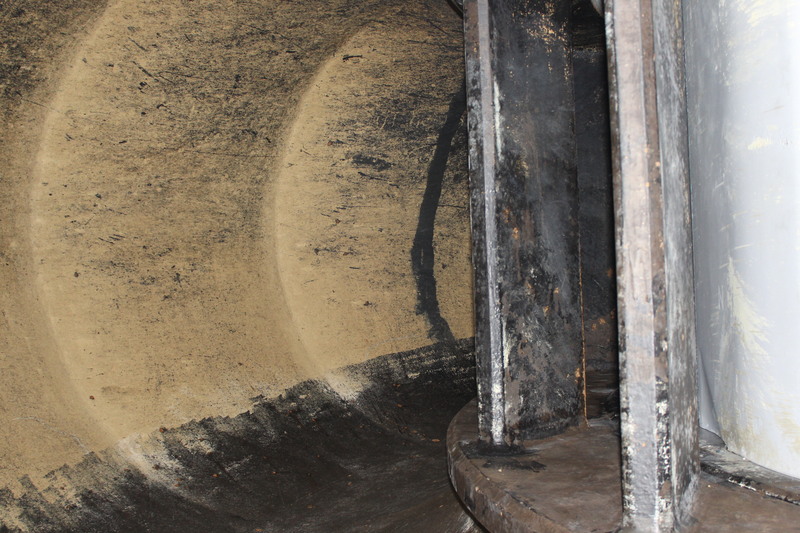 Approximately 25.5 million cubic yards of sand and gravel were pumped during the process. 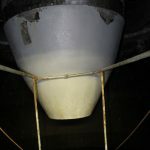 Following completion of dredging activities, workers plugged the huge tube that carries water from the North Platte River beneath the dam (now connected to the Morning Glory Spillway) and water began passing through the Control Tower. The process of filling the reservoir was expected to begin in the spring of 1941. November, 1965 – Central crews, under the supervision of Kingsley Dam Division Manager Bernard Donelan, finished what was originally planned to be a three-year project of placing 800-lbs. tetrahedrons on the face of Kingsley Dam. The 16,360 “tets” were placed in a matter of months because the growing season proved to be wet, resulting in low demand for water from Lake McConaughy and freeing up members of the crew to work on the dam instead of their normal irrigation-related duties. A private contractor poured the concrete jackstones at a site near the dam and subsequently manufactured several thousand more to stockpile near the dam. The jackstones were designed to protect the dam’s face by breaking wave action against the dam. 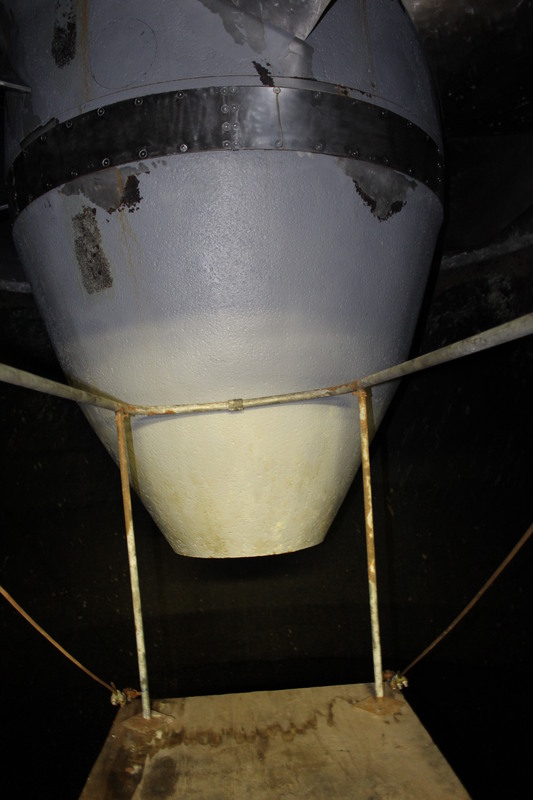 November 2009 – After 25 years and generation of almost 2 million megawatt-hours of electricity, the Kingsley Hydroplant finally required significant repairs and maintenance. 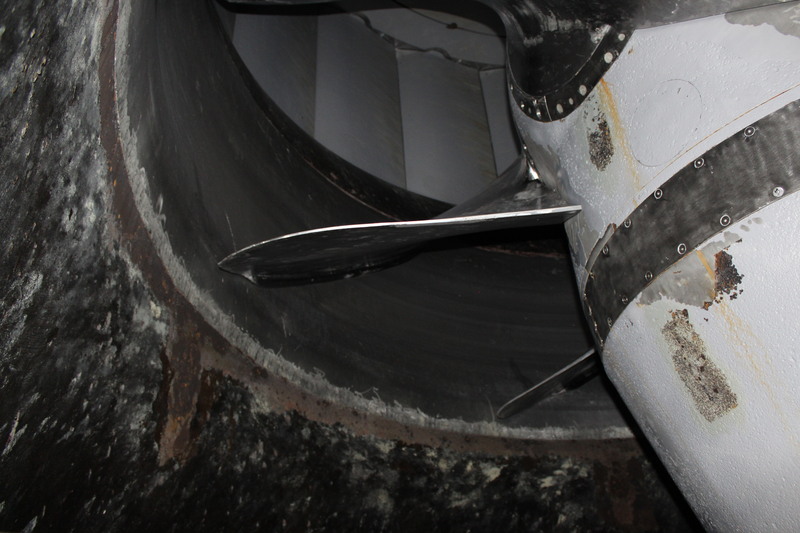 Central crews began complete disassembly of the turbine-generator unit prior to repair of bushings in the turbine hub, cavitation repair on the turbine blades, refurbishment of wicket gates and oil seal improvements. The $4 million project was completed by March 2010. Oct. 10, 1955 – Central’s board of directors and management announced plans to build a 100-megwatt power plant to be fueled by natural gas. The plant, which went on-line in 1958, was constructed adjacent to the Supply Canal southeast of Lexington, was named the Canaday Steam Plant after Ralph O. Canaday, who served as the District’s legal counsel during the formative years of efforts to bring an irrigation project to south-central Nebraska and later served as Central’s chief legal counsel and general manager. Oct. 17, 1956 – During a drought in the mid-1950s, Lake McConaughy dropped to its lowest elevation on record since the reservoir’s initial fill. The lake’s elevation on this date was 3,198.2, with a volume of 348,900 acre-feet. At the time, the reservoir’s maximum capacity exceeded 1.9 million acre-feet, so the amount of water behind Kingsley Dam represented only 18.4 percent of capacity. The low-water mark would stand until September 2004 when the lake fell to an elevation of 3,197.6 feet during another extended drought. At that time, Lake McConaughy contained 341,400 acre-feet, or 19.6 percent of its current maximum capacity of 1,743,000 acre-feet. The reservoir’s maximum capacity was lowered in the early 1970s after a 1972 windstorm damaged the protective face of the dam. Oct. 19, 1964 – A project began to replace an original – and somewhat iconic – structure along Central’s Supply Canal. The “High Bridge,” located on a county road over the canal south of Cozad was 219 feet long and stood 74 feet above the canal’s water surface was originally constructed in 1938 and was the highest bridge in the District. Age and wear-and-tear took its toll on the wooden bridge and it was replaced by a new bridge that stands 33 feet above the canal. The original “high bridge” under construction over the Supply Canal south of Cozad. The replacement bridge under construction in 1964. Oct. 26, 1990 – More than 800 people attended a “scoping hearing” at the Ogallala City Auditorium conducted by the Federal Energy Regulatory Commission in connection with the relicensing of Central’s (and the Nebraska Public Power District’s) hydroelectric project. More than 35 people testified during the five-hour meeting, almost all in favor of issuance of a new license with conditions that would not hinder provision of the many benefits from the project. Oct. 27, 1997 – Central construction crews began an earthwork project to raise the head above a siphon on the E-65 Canal and to install more than 2,000 feet of synthetic membrane. The earthwork would provide six more feet of elevation above the siphon to increase the volume of water passing through the mile-long pipe. 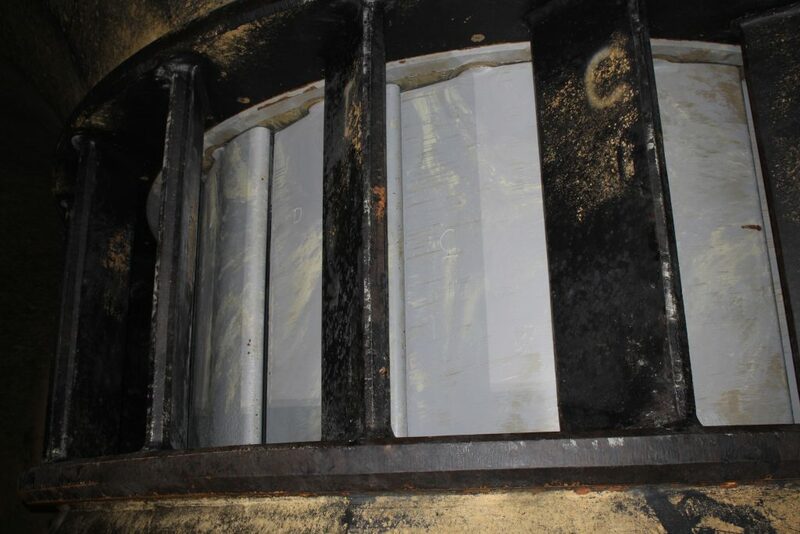 The membrane lining significantly reduces conveyance losses and prevents bank erosion along the E-65 Canal between the head gate near the Johnson Lake inlet and the siphon. October 2001 – Central started a major rehabilitation project on its three Supply Canal hydropower plants. 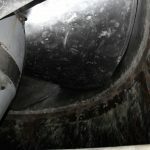 The project involved replacing the original turbines, rewinding all five generators and installing a new transformer in the J-2 hydroplant switchyard. 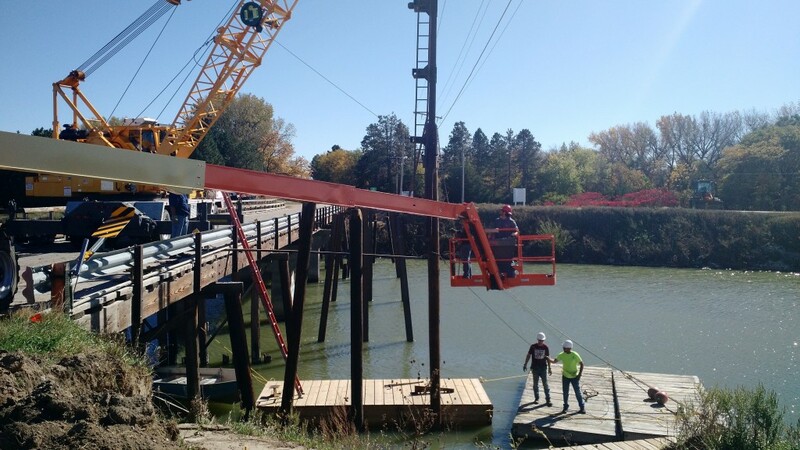 A Central crew began construction of the pedestrian bridge over the Johnson Lake outlet canal in early October. The last pilings were driven on Oct. 12, setting the stage for construction of the supporting infrastructure and deck. When completed, the bridge adjacent to the existing road bridge will afford safe crossing of the outlet by users of the lake’s hike/bike trail. The 10-feet-wide bridge will be constructed of wood and rest on steel pilings. 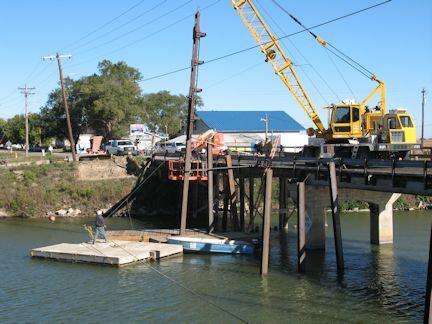 Central used a 30-ton crane equipped with a pile-driver that was positioned on the existing road bridge. Using the existing bridge as a “base” for construction will save on the cost of the bridge. The bridge is scheduled to be completed before Thanksgiving. Central personnel finish driving the last steel piling for the pedestrian bridge.